Reiki is an ancient Japanese healing system. It is administered by the laying on of hands, through which life force energy is transferred. The word ‘Rei’ meaning God’s wisdom or Higher Power and ‘Ki’ meaning life force energy. 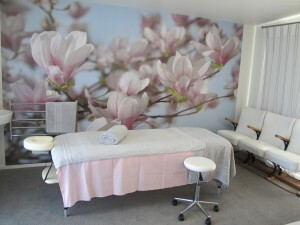 Tranquil Therapy Gift Vouchers are a great way to treat a special someone. Whether it’s for a Birthday, Mother’s Day, Christmas Day, Valentine’s Day, a special occasion, or just to say “Thanks!”, our gift vouchers are an excellent idea for thoughtful present. Give them the much needed break and relaxation that they deserve. Vouchers can be posted, dropped off, or emailed to suit. Some of our most popular therapeutic gift vouchers are available in our online health store. If you can’t find the right voucher in our online shop, can specify a specific therapy option from our Treatment Menu, or you can nominate a dollar value and let them pick and choose as they please. Any questions? 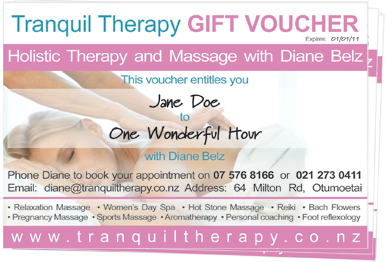 Contact Diane to customise a gift voucher for that deserving someone today. Ready to purchase online? See the range of Gift Vouchers available to order form our store now.